Location, along with price, is the most important factor in accommodation booking. Online travel websites need to provide location information if they want their visitors to become customers. Here is a real-life example of how TopPlace™ technology meets that need for FG Hospitality Group, who have recently integrated TopPlace™. 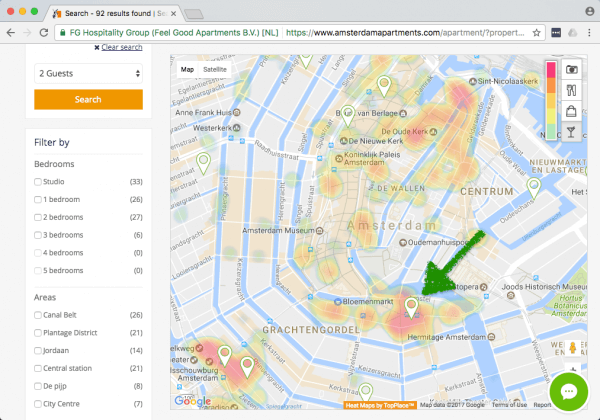 Let’s book an apartment on amsterdamapartments.com – one of the Group’s websites. 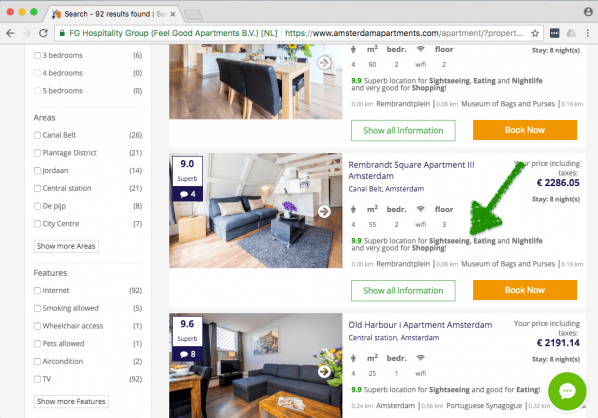 We are going to search for the best apartment to stay for the Amsterdam Gay Pride which takes place 29 Jul – 6 Aug 2017. We can also go to list view and see how good a particular apartment is for our interests and what the nearest sights are. Look! This one has an amazing score for Sightseeing, Eating and Nightlife and is right on the Rembrandt square! The perfect choice has been made within minutes and now we are ready to book.